Dr. Chau Chak Wing is a well-respected Chinese Australian leader, founding Chairman of the Kingold Group, and President of Australia China Friendship and Exchange Association. In the early 1990s, Dr. Chau Chak Wing started to invest in Guangdong Province China. Upholding the value of Doing the best to achieve the best, Dr. Chau developed a number of landmark projects in Guangzhou, including Guangzhou International Trade Center, the Favorview Palace Estate, Imperial Springs, the Bayview -- a residential project, and the Kingold Century -- a top class office building. Apart from those real estate projects, Dr. Chau also successfully restructured the Guangdong Huaxing Bank. As his business grows, Dr. Chau Chak Wing has been devoted to promoting China- Australia relations in the fields of economy, trade, culture and education, thus highly acknowledged and commended by the governments and people of the two countries. 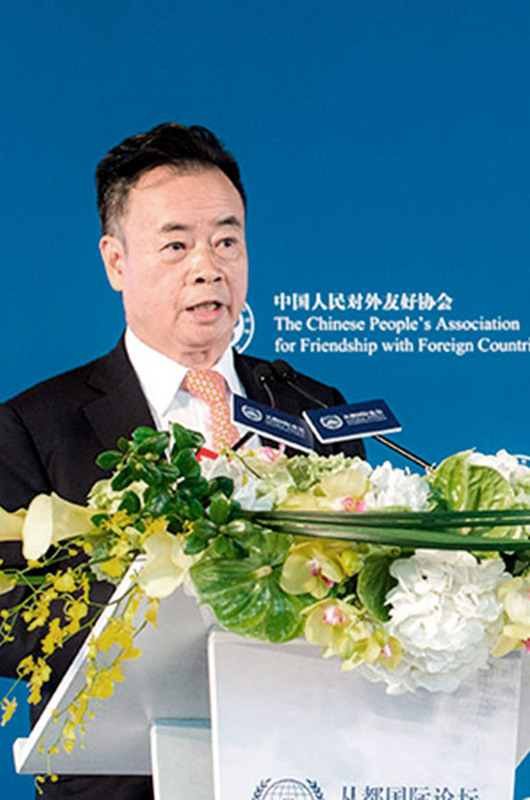 Additionally, Dr. Chau has invested to build the Imperial Springs International Convention Center as a high-profile platform for business leaders, scholars and political dignitaries from worldwide to exchange views and ideas on the topics of major concern. Since the opening of the Imperial Springs in 2011, many worldfamous dignitaries and representatives of international organizations have come here to attend conferences, including the China-Australia Media Forum, the China-Australia Friendship Forum on Economy and Trade, the International Museums Forum, the Global Economic Forum, the Global Summit of SME Leaders, and Going to Latin America Forum and the Imperial Springs International Forum. 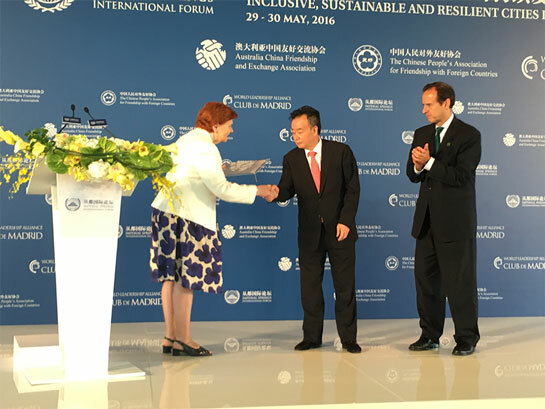 On 29-30 May 2016, the Australia China Frienship and Exchange Association, the Chinese People's Association for Foreign Countries and the World Leadership Alliance - Club de Madrid jointly held the 2016 Imperial Springs International Forum under the theme "Inclusive, Sustainable and Resilient Cities in the Belt and Road Initiative". Eight Club de Madrid Members, including its President and former President of Latvia, Vaira Vike-Freiberga and top Chinese represensatives such as Mr. Hu Chunhua, Member of the Political Bureau of the CPC Central Committee and Secretary of the CPC Provincial Committee of Guangdong, together with Mr. Zhang Baowen, Vice Chairperson of the Standing Committee of the National People’s Congress, were present at the opening ceremony. One hundred top experts in urban develpment also attended the discussions at the Imperial Springs International Convention Center. During the final session President Vaira Vike-Freiberga announced the designation of Dr Chau Chak Wing as Chair of the Asia-Pacific Region World Leadership Alliance - Club de Madrid President's Circle as a way to "express our gratitude and recognition of his outstanding contribution not just for for the Imperial Springs International Forum but for all future common endeavours". As a business leader, Dr. Chau Chak Wing has been active in giving back to communities in China and Australia, including donating a Business School building to the University of Technology Sydney, donating to build a new museum at the University of Sydney, and funding many schools, such as Chaonan Vocational Education Center in Guangdong, as well as supporting the elderly, the unprivileged and the disaster relief at the distressed areas within China. Therefore, the People’s Government of Guangdong Province awarded Dr. Chau Chak Wing the “Outstanding Contribution Award”. The People’s Government of Guangzhou Municipality awarded him the titles of “Honorary Citizen” and “Philanthropist of Guangzhou”. The Kingold Group has won a number of honors from the People’s Government of Guangdong Province, including the “Most Socially Responsible Enterprise”, and the “Outstanding Contribution Award for Charity in Guangzhou”.